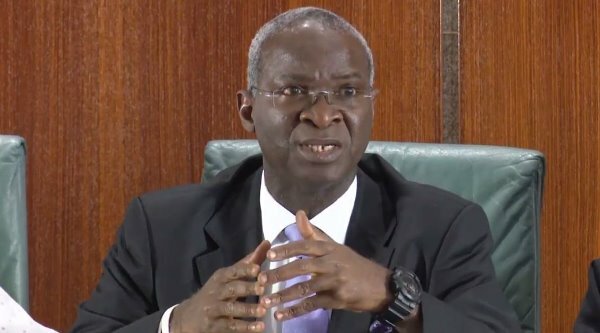 The Minister of Power, Works and Housing, Mr Babatunde Fashola, has ordered the immediate suspension of work at the Abuja National Housing project in Gwagwalada, in Abuja. Fashola gave the order during the inspection of the ongoing Abuja Mass Housing project in Gwagwalada, on Monday. The Federal Capital Development Authority (FCDA) had written “Stop Work Inscriptions’’ on buildings at the construction site. He said the suspension became necessary in order to settle any development control issues with the ministry and FCDA through due process. “As you can see, there are Development Control inscriptions on the buildings and it means there are development issues by the FCDA. My staff told me that the issue has been resolved, but I also respect the law that says every development control restriction inscriptions must be complied with. “‘So I am not going into that building; and I have ordered the head of unit here to stop work immediately until these inscriptions are removed and I see documents to that effect. “This is one of the many ways that we can begin to take our laws seriously because this is a government development project and we need to respect the laws we make,’’ Fashola said. The minister said that the construction of the mass housing project was ongoing in 33 states across the country where lands had been made available. He stated that aside from artisans involved in the project, contractors were engaged in the pilot scheme to deliver quality work. “The last time I was here, I was satisfied with the quality of work and I saw carpenters that were seriously engaged in the construction work. “That is what the Federal Government wants to achieve; to use housing schemes to stimulate employment in the country. “The Federal Mortgage site is a different concept entirely, they do not only lend money, but help you to build for people who want to pay rent,’’ Fashola added.